It’s a great feeling to breathe new life to old outdated devices. After I bought the Samsung Galaxy Note 3 for my wife, she passed me the first-generation Note for my disposal. The Note 1 running on the official Samsung ROM is kindda laggy and does not have the same feature list as the Note 2 which was only recently dethroned by the Note 3. It didn’t take me long to do a quick search and find third party firmware that I could easily write over. Voiding the warranty was never an issue since the Note is long past any after-sales support. There are many custom ROMs to choose from. Some are clean Android stock OS, while some create their own feature list that they feel are the best. For me, I went for the Ultimate ROM which is based on the original Samsung UI but included most of the features in the latest Galaxy devices that are not hardware-constrained. 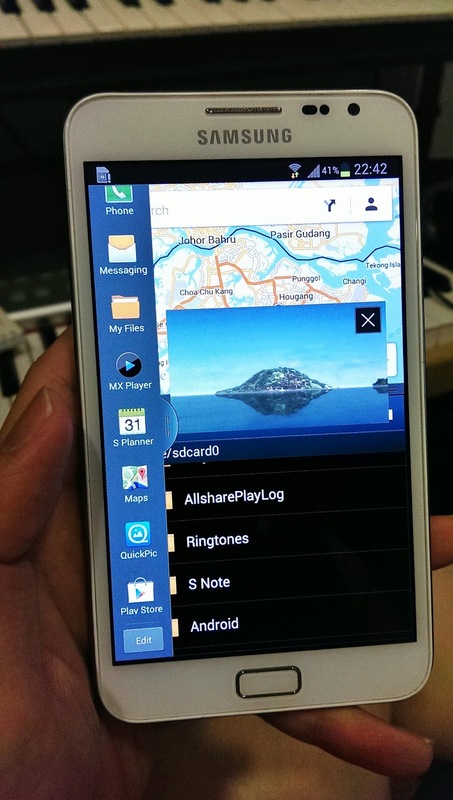 Multi-window plus floating video window on Galaxy Note 1. Yippee! In short, my Galaxy Note now works like the Note 2 and S4, except with a slower processor. In fact, the custom ROM allows me to do more. For instance, I can practically use any third-party apps on multi-window, and the ROM removes some bloat on the stock ROM so it appears to run more responsively. And despite 2 generations old, the Note 1 is actually powered by a dual-core Exynos 1.4GHz processor which is close to the latest Samsung Galaxy S4 Zoom camera phone. One shouldn’t expect to perform miracles on the device, but I am just elated that I can continue to enjoy the latest features of the Samsung Galaxy series on the original Note.